Taking two weeks off from blogging was not planned at all. From day one of starting this blogging journey I always promised myself that if I ever got to the point where I hated blogging and wasn’t happy I would stop doing it. With working 40+ hours a week and trying to remodel and move into a new house, things got a little chaotic and stressful. I found that on the weekend I always wanted to be working on the house but yet felt guilty for not doing anything for the blog. I was then in this constant battle of being upset that I was feeling guilty working on my house and was constantly torn about the future of this blog. I have always felt that it is super important to be happy with yourself and your life. Truth is I wasn’t happy and every time I thought about the blog I got sick which is why I took a step back. I didn’t want to fill the space of my blog with halfhearted posts in order to just have something new posted that day. Instead I wanted to give myself time to enjoy the new adventure that I was starting in my life without guilt. It’s hard to find the perfect way to balance everything in my life but I’m trying to adjust. To be honest, I still don’t know the future of my blog. It’s been such a huge part of my life and I cannot imagine not continuing it. This blog has brought me so much joy, friendships, and laughter over the past years. I just want to continue to enjoy doing it. As I learn to adjust I just hope you will continue to support me. Please know that I will always value and am forever grateful for each of your love and support. With all this said, I will see you tomorrow with new posts. Definitely not going anywhere. I'm sticking with you! I loved this post so much! I've been blogging for several years, going through those phases when I wasn't "feeling it" at all, but I thought I had to be present everyday to make my blog grow. 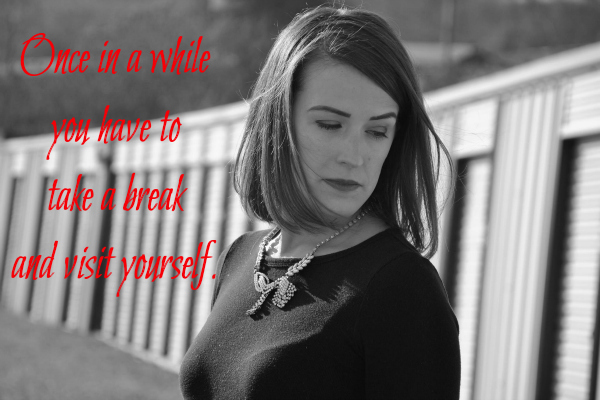 But ever since I started my new job, keeping up with daily blogging proved to be very challenging, and I've learned not to be so hard on myself, and give myself a break when needed. I blog about things I'm passionate about, and I don't want to insult my readers with half-hearted posts, so I love your philosophy! I'll be checking back on you again, to see how it goes :) Good luck with all your adventures! Babe. This blog should always be about what is in your heart and soul, a creative outlet. It should never be work or a chore. If you don't love it, don't do it. YOU (and your life) should be your first priority and shouldn't have to apologize for that. You know I'll always be here any time you feel like posting!